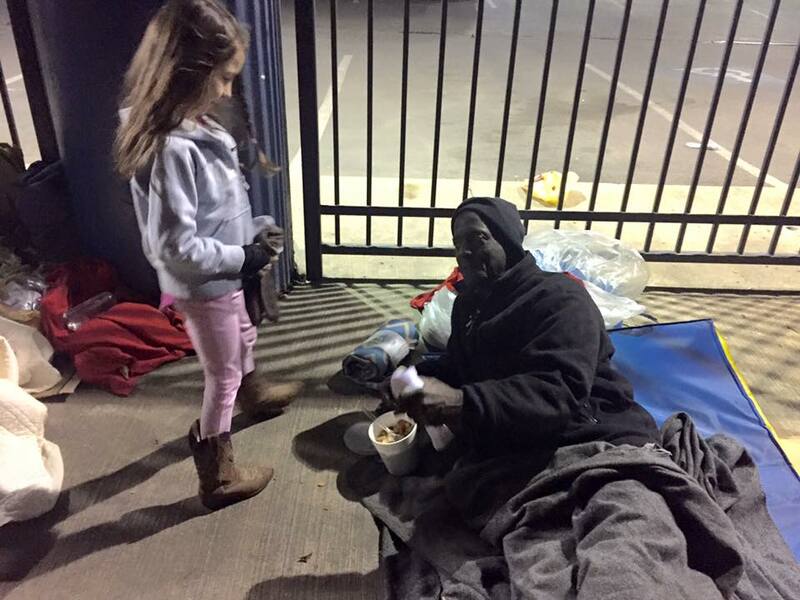 About a month ago, Our 5 year old daughter, Kylie, asked us to help her pray for $100 to give to the homeless. Jeremy and I were touched. We have helped her to pray almost every night since before Christmas. Yesterday started off as any other day. I woke up and got Kylie ready for kindergarten. After My husband and daughter were on their way, I jumped in the shower to get ready for MOPS. At about 8:00 my husband called from the road. He had been listening to the radio broadcast about the homeless and the desperate situation they were in due to the cold. Jeremy, my husband who rarely sheds a tear, was crying. Knowing that we had very little money to help, I suggested that we both pray and ask God for guidance. Jeremy and I both sent emails asking for help. I placed a box on my front porch and left for MOPS. I mentioned the need again at MOPS and went on with my crazy day. Before I left MOPS I had $85 in my hand. Jeremy had collected about $100. At 11:30 am it looked as if we were going to get to tell Kylie that God had help us to raise almost $200! We were thrilled at what God could do so quickly, however, God had BIGGER plans. At 6:00 pm God had put together over $700! We had 3 huge boxes full of blankets and coats! We went to Academy in the Brazos Center and bought them out of 3lb sleeping bags! Academy even threw in some money to help us. The staff was so excited and was amazed at the generosity of so many. Several empoyees gave my husband their personal contact information and asked to be involved in future efforts. We left Academy with over 70 sleeping bags! So much for the whole family going in one car! We laid the seats down in my husbands Explorer and filled every inch of space with the sleeping bags. We took all the coats and blankets an filled the back of my SUV being careful not to bury Kylie and our 2 year old, Lainey...a near impossible task! Marcus, a friend from church and his friend Gigi wanted to go along for the ride. We met them at Starbucks before heading downtown. We puchased 3 large carafes of hot coffee to pass out. Downtown was quiet. However, there no shortage of homeless to help. We met mostly men and a few women. All were so happy to see us and especially the sleeping bags, coats and blankets you donated. We helped them put on the coats, poured them coffee and gave away girl scout cookies (Thanks Megan!). We were privledged to get to pray for some of them. It was amazing to hear their stories and listen as they shared thier hopes and dreams for a different future. My favorite was a precious man named Billy. All he wants is a scrap yard. Along the way, people wanted to know if we belonged to an organized charity. We explanied that we were not with any charity and that God had answered the prayer of our 5 year old daughter. If you prayed for our protection last night we want to thank you. About 10 minutes into handing out donations, 2 constables pulled over to ask what we were doing. They were amazed and generously offered to stay with us. They escorted us through red lights, blocked off streets and got out of their patrol car to stand close by as crowds of homeless approached us. I felt as safe as a kitten! At one point, a car full of the Black Panthers all wearing their uniforms pulled up to tell us they were going to be watching out for us and to thank us for everything we were doing. They told us not to worry, that we were safe. God is good! If you helped by donating, praying or even forwarding our emails, you were the hands and feet of Christ. God moved in a big way yesterday. I am not sure how many people we helped, but we came home with just a few women's and children's coats. All the sleeping bags and blankets are gone. We plan take the few leftovers to the Star of Hope today as well as purchase a few more sleeping bags with some last minute donations. Thank you for your love and support. My family will never forget this miracle. We are forever changed. Please forward this email to anyone you passed it along to yesterday. Your friends came through! Thank you and God bless you!